June 03, 2012 by Alphageek in "alphageek", "review", "urbanspoon"
This is a relatively new restaurant that serves all kabobs all the time. We had some good food, but there is a real treat of a meal here. What is this treat? Read on to find out! Below is the food we ordered for takeout one day. The dish that you see centered is the chicken and lamb combo. This dish is a tasty combination of seasoning and cooking to bring out some really great flavors, that one cannot get just anywhere. Lots of roasted spices bring an exotic flavor to the meal. The bread you see is quite a bit bigger than in the photo, and is an excellent flatbread, for soaking up the lentils and spinach sides that you can see. Additionally, there is a side salad. The rice has some exotic flavoring as well, to round out the meal. So, what is that other meat dish, peeking out from the right of the photo? By the time we knew this tender bit of lamb would be the star of the meal, we were done with pictures. If you want the best thing they make there, try the Chopan Kabob. This dish is several tender, grilled piece of lamb, that virtually melt away in your mouth, spreading their grilled goodness everywhere. Because you read here, we have an alphageek tip, just for you. 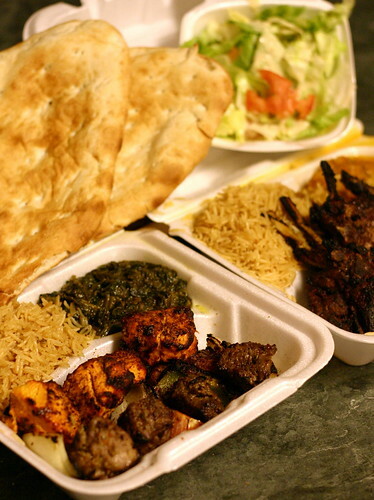 Call your order in ahead of time, if you get Chopan Kabob. They are really cooking at Kabob Corner, and this dish takes about 20 minutes or so to prepare, but the wait is worth it. Kabob Corner also offers up some veggie kabobs as well, for those of you so inclined. I keep getting questions about vegetarian restaurants, so we will begin to start posting at least a little information for the meat challenged audience. For a map, either take a look at our embedded map, or click on this link.